My idea behind doing these 20 days of play therapy is to show you that you can do everyday activities with your little one that also give you insight into some of their inner thoughts. I know for some of you, the temptation is to obsess over knowing these inner thoughts of your child. Carrying a child in your body and nurturing their existence in this world can make it difficult when your child begins to think independently, leaving you clueless to what’s happening in that little head. I watch mothers, well into the child’s adulthood, remain overly attached because they feel they need to know exactly what they are feeling- to the point they want to feel it with them. This is a recipe for disaster for this adult-child’s marriage. Remember that your child’s heart and soul are to be tied to their future spouse. God designed this for the protection of their unity. The sooner we realize we are not meant to fully “get” them, the sooner we will be content with the relationship we are given with this person. This should push us on our knees more often, surrendering our control to the Creator who knows everything. We had an hour drive to Savannah to run errands, so this was perfect to do in the car. Knowing that we were all staring straight ahead made it easier for vulnerable moments in the discussion and an occasional turning around to comfort little eyes who needed connection. 1. The child gets to tell a story that includes characters and any storyline they want- as long as it is not a story they have heard before (no books, movies, video games, etc). Although they could use characters they know (Aidan asked to use Batman) I would encourage the child to come up with an entirely new character. 2. I would normally have older children go last, since their ability for detail can make younger one’s efforts feel minimized or “not as good”. 3. Try to pay attention to characters that sound familiar, sound like the child or family members, or part of the storyline that relates to an experience the child has had (bullies, loss of someone or something, etc). 4. Once their done, use their same characters to re-tell the story that stretches their understanding or coping. If they are younger and need help, you can retell it and have them help you. How would you end it differently? What would that character learn from the new ending? Encourage older children to retell their own story and figure out the morale of the story (3rd grade +) or what the character learned. I’ll tell you how this played out for us. At first, the boys seemed confused. They asked a lot of questions about telling stories they already knew. Once I gave an example of my own story, interestingly enough, Aidan asked if he could tell a dream he had. This was perfect. Storytelling with dreams, especially bad ones, create a great opportunity to re-write the dream- an effective technique for ending or altering re-occurring nightmares. Jack was a little resistant (being 6, he had a bad attitude already from being tired). That’s okay- Aidan (9) is always game for going first. Aidan, who is coming out of the stage of using fantasy for coping, told a dream involving zombies that were moving on the cover of a magazine on the stairs. He ran upstairs and looked out his window to find many more zombies coming toward the house. This was the point where he woke up (I remember him coming to get us in tears). When we asked for him to try to come up with a new ending, he played out violent acts on the zombies (even though he’s never seen a zombie movie, this is the new playground hide-and-seek game- UGH!!). We didn’t stop him, even though I didn’t like Jack hearing of zombies getting their limbs ripped off, so as to give him the opportunity to finish. Since he is old enough to cognitively think through fantasy and reality, we asked him afterwards if zombies were real. He said “No”, so instead of us re-telling the story we asked him how he could re-tell the story again without violence considering they were imaginary. 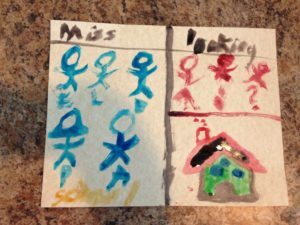 Resist the urge to “do the work” for the child. You will often find their own creativity much more powerful than yours. In fact, self-discovery is always the best way to “catch” new learning. Believe it or not, Aidan closed his eyes and told himself (in the dream) that “Zombies aren’t real”. He took the magazine to a shredder and shredded it into a million pieces and looked out the window to find they were gone (LOVE IT!!). It was only then that I added, “You know, if it is your dream, you could imagine anything you want outside that window. Pool parties with all of your friends, all eating your favorite ice cream, everyone happy and excited to play with you, and lush green grass all around.” This experience was perfect for him, since he is seeing more of reality and having to figure out what to do with fantasy that is scary. 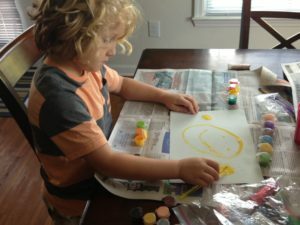 It also teaches him how to take his mind “captive” and control his thoughts, imagination, and fears. AWESOME!! **Most parents would freak out at this moment. I’m not saying that you shouldn’t, and if this was chronic and you saw daytime fears and phobias that interrupted your child’s functioning at home or at school then professional help is a good direction to go. But for Jack, this has not been happening. I knew he had had some normal “night terrors” in the last year, but none that played out during the day. So when he said this in the car, I took it as testing. Children often use “shock and awe” to test the adult. In a sense, it is a way to see if they can trust you. Your reaction to them tells them whether or not you can “handle” them. This is an important moment! If you freak out, then you can send the message that their problems stress you out and scare you. If you beg for more information (which they may or may not have) it gives them extra attention- and we want to give them other kinds of healthy attention. The real test is to see if you can remain calm, let them know that you are safe, not worried, and will be ready to listen when they are ready to talk to you. Sometimes they won’t unpack these scary thoughts until you prove you are safe, other times they may open up. Sometimes you may find that they never had that dream to begin with. I had a child begin telling me about a dream and tried this testing. As I remained calm, her story oddly kept changing to become more “shocking”. Once she realized I was safe, she was finished and probably had a really fun time telling a crazy “out of the box” story. The morale was- I was safe, we had fun, and she could now tell me anything- GAME CHANGER!!! So, Jack never did tell us about those dreams, but did tell a safer one. These “scary” themes are developmental, so I’m not worried. Even though he still into fantasy coping (yesterday’s painting about the future), he is realizing that there is an end to life. My grandfather passed away in October and that was hard for all of us. There were plenty of questions about that. This boy injures himself on a daily basis, but for him- blood can mean an emergency room visit- not life sustaining cells that keep our extremities alive. He is trying to figure all of that out, and to a 4-6 year old that may play out in dreams where these themes show up in no particular order. But it does give me opportunities to address loss, death, and life at other more opportune times. To which the boys came up with “Good things can come out of bad experiences!” Perhaps Jack will test that theory later by sharing more of his own scary moments. For more about how you can use storytelling, visit here. So after my failed attempt to lovingly serve my boys a turkey sandwich with acceptance and unconditional positive regard, we cleared off the table for painting. I personally love painting with kids. It’s fun, easy to take out and clean up provides great insight through colors. Colors are powerful and are used to market products to us everyday. Green (also the color of money) actually makes you hungry. Blues and greys are calming, typically colors you find in spas. So naturally, the subconscious can choose a color to reflect a feeling without having to think about it first. This is excellent when working with kids. What colors do you think of when you are angry? Most will say red, or black. What colors do you associate happiness with? Most would say yellow, or orange. Pretty easy, huh? Try not to be too concrete on this. If your child has a another reason for choosing a color that seems like an odd choice, they could be associating that color with an object they saw that evoked that feeling or may not be at a place where their emotions are congruent (as you will see was Aidan’s case). For more on what colors can say about feelings, here is a great chart. So, this past week, Matt and I introduced to our boys that a move in the winter time was highly likely. We wanted to give them plenty of time to process it and talk about it with us, especially if anything changes. I figured this was a great topic to start with. Aidan’s what a bit more intriguing. He is older, now coming out of the fantasy stage of development. He is shifting his focus more towards peers, playing with others, and developing who he is as he relates to peers. Of course this will peak as he gets into adolescence. Being that he is also interested in details, he wanted to make a list rather than a picture. 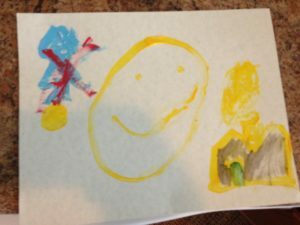 I encouraged him to be creative and do his best to put a picture to his feelings rather than list words. This was a good challenge to him as he normally pushes down his feelings until something emotionally pricks him hard enough. 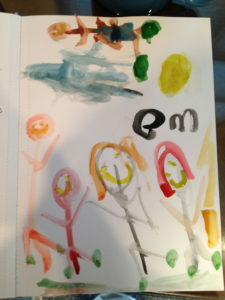 Finally, here is one of my favorite paintings from a 5 year old client I worked with for a year. She gave me permission to take a picture of it and keep it. She lost her father tragically and spent a majority of that year coming to terms with him being gone. Our goal was for her to see him as “with her” but okay with him not physically being here. After months of angry and sad paintings with red and black and grey reflecting all of them together with sad faces, this was her final picture. Here she shows her with her siblings and mother all together without him. Notice how they all have smiles on their faces! All happy colors and green grass. She is moving to a new house in this picture and her father is right where he needs to be, always with them, but in heaven (he also has a yellow smile that is hard to see). There is nothing like being excited to start a new project to benefit all the other stay-at-home moms of the world and then be completely humbled by the frustration of little people with whom you are about to do awesome stuff with. Isn’t that how it goes? I mean come on. I am riddled with guilt everyday over all the things I could and should be doing with my children, knowing that they will go to their own therapist some day complaining of how I didn’t spend time enough time playing with them, And then the therapist will look at them with concerning, understanding eyes and ask “What did you mom do for a living?” And they will say I was a therapist. So the pressure is on, or at least until I let it go. Today, I just take a deep breath and remind myself that I am human and someday they will accept that too. So, day one. I’m pumped about painting with them, but tell the boys we have to have lunch first. The next thing I know, I am in massive conflict with my nine year old who wants his turkey sandwich just like Subway. Now, I am all about options. In fact, that is the first think you should know about play therapy. You can’t walk in with a complete agenda- there has to be room for creativity. So I decided to set the atmosphere. “You can have a sandwich, but anything but PB&J, just for today.” Well the fight was on. “I’m out of wraps. What if you be creative and make one like Subway? You can choose your ingredients!” (Said with great inflection and positivity). “Ummmm…. Sure… but I don’t have Italian bread, just my awesome homemade bread.” (Said with less inflection and less positivity). Here is where it got bad. My nine year old who is extremely detailed starts to place his Burger King-type of order. He wants it toasted, with Ranch, but wants the lettuce and Ranch put on after its toasted. Of course, that can’t be done after the freakin’ cheese has stuck the whole thing together! “But that’s they way Subway does it!” (He says with great confidence). I’m beginning to lose it here, cause, geez kid- I’m trying to set the stage for healing and understanding and what I’m getting is a stand off over a turkey sandwich. We got through lunch with a little bit of compromise for both of us, reminders that we are NOT a Subway kitchen, another lesson in talking back, and a humbled Mom who is reminded that you can try your best but these are different personalities you’re working with. When you are the parent, you will only get so much from your child. That’s why a therapist is considered safe and disconnected. But what I want to arm you with is some tools to take to your play time so you can really listen to your children. So with that, let’s talk about a few basics. When you can, give them options on what they would like to play. Some days they will feel like painting, other days may be a sand day. (Tomorrow, I will be armed with more choices). Don’t ask leading questions like, “Doesn’t that make you feel sad?” Instead, try to use as few words as possible. Try, “When you think of [that], how does it make you feel inside? Kids open up more when you aren’t making eye contact. Playing side by side is less threatening and the brain is not multitasking on 2 things at once. Sometimes play can be how they are currently feeling and other times can be used to help them think ahead at how they will handle the future- try not to rush them into the latter. Put your phone in a different room! This is family time. If you or the child seems frustrated, or finished… end it. You may want to paint for 2 hours, but they may be done in 5 minutes and that’s ok. So, there you go. I will share with you tomorrow how our first day went. I also hope to give you resources for each technique in case you want to read further. Remember, don’t take it too seriously, and don’t read into it too much. If you get concerned, call someone to help. As I go along, I want to hear from you on what areas I’m not covering or what you would like to see. Happy playing! !